This LEd panel display board is specially designed to display Gold and Silver rates . Reilability of the LEDs is enhanced with the microprocessor based technology. Affordable price is another plus point of the product. 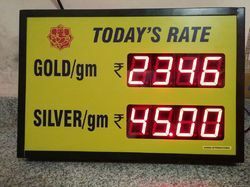 Looking for Gold Rate Display Boards ?